You can't avoid conflict in your life, at home, at work, and even at play. Wherever people interact, there is a potential for conflict. That's not bad news because good things can arise, and relationships can improve through conflict, provided conflict is managed with thought and attention. The bad news is that most of us are fairly limited in how we manage and resolve conflict situations, often throwing gasoline on the fire. It doesn't have to be that way. We've gathered together the best and most useful free online resources and tools to help you manage and cope with conflict more effectively. Whether you want to learn about conflict at work, between siblings, within the family, or any other context, you'll be sure to find help on these pages. Originally created for our own research purposes, we decided to publish the directory so others could use it. Alternate Dispute Resolution (or ADR) is often used instead of going to the courts and provides a different method for addressing disagreements and conflict. Learn about it here. People who have problems controlling their anger are often involved in serious conflicts. Learn about anger management, its importance and anger management techniques. Arbitration is another technique to address conflict and disputes and involves a third party stepping in to make a decision. Learn about arbitration here. We've all worked for difficult managers or supervisors with whom we come into conflict. In this section find advice and tips about how to deal with conflict with difficult bosses and managers. Bullying is an overused term as it becomes a popular way to describe all kinds of behavior. However bullying does occur in families, at work and school. Learn more about bullying here. Violation of ethical codes can create conflict problems in the workplace. Here are some interesting ideas about ethical behavior. Articles on the coaching process, for all levels including executive coaching. Communication is both a cause of conflict and the prime tool for addressing and managing it. Learn about effective communication techniques here. Learn about all aspects of conflict and conflict management including mediation and ADR from the hints, tips and help available in this general section on conflict and conflict management. Teams and work groups almost always have to deal with within team and group conflict. Learn about how to best deal with conflicts within teams from these materials. 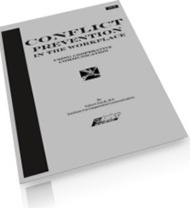 This section is dedicted to help with conflicts that occur at work and in the workplace. Managing conflict at work is a critical component of workplace success. Make sure to check out the other related sections. Managers and supervisors play special roles in helping their employees and organizations deal with conflict and manage it. Leadership is part of it, but so is mediating, negotiating, etc. Here you'll find help for managers and supervisors. Learning to manage conflict more effectively requries a desire AND skill development. In this section, you'll find resources to help you develop your conflict management and resolution skills. The better you understand how you tend to manage conflict, the more likely you will be able to get better at it. Here you'll find explanations of various conflict management styles, their strengths and weaknesses, and even some quizzes to help you assess your own conflict preferences. Learn about the various models and theories of conflict from psychologists, social workers and other conflict experts. Find more academic and research papers in this section that highlights conflict management. In this section you'll find valuable advice, tips and ways of looking at conflict that will help you resolve it. Difficult conversations, or crucial conversations involve things that need to be said, but the other person or person is bound to have their feelings hurt or react negatively. In this section we'll look at methods to talk about difficult, awkward topics with people you care about. Difficult people can drive you nuts, and if you're difficult, you may be driving others nuts. Learn more about what makes difficult people tick, and how to deal with different kinds of difficult people behaviors. Learn about diversity and culture, how to create diverse organizations, and increase your understanding of the links between diversity, culture and conflict. Practical suggestions about resolution of conflict that is linked to culture. Parents and children often come into conflict over large and small issues, regardless of age of the children. Learn more about dealing with conflicts between parents and children from these resources. Conflict with brothers and sisters is a natural process, and occurs in every family. Learn more about conflict between siblings and sibling rivalry and how to deal with it. Sometimes it's not whether you win or lose an argument but how you act during an argument that dictates a positive or negative outcome. Learn to "fight fair" during disagreements and conflict. Conflict at work can be subject to various labor laws. Learn more about labor laws, how they may protect both employee and employer. Something many people have trouble with is letting go of a conflict, and its associated emotions. Some experts call it conflict resilience or the ability to bounce back. Here's some help. Most married couples experience conflict sometimes. Learn about then nature of conflict in marriage, and steps to take to reduce and manage it effectively. If you've gone through a divorce you know how conflict riddent the process is for you, and the damage that can occur for children. Find hints, tips and ideas for reducing conflict in these situations and making the best of tough family situations. Learn how mediation is used to resolve conflicts in business and in family disputes and divorces. 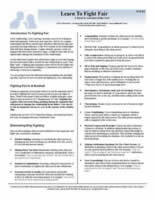 Find information to help you participate, or browse information about mediation techniques and skills for mediators. Here you can access online media (podcasts, audio programs, videos, even online courses) on the topic of conflict and anything related. The 2016 election campaigns have given rise to a style of campaigning and political rhetoric on the part of candidates that could described as winning through bullying, or verbal abuse. In this section we'll look at candidate behavior and its effects both on politics and society in general. Find free help, tips and suggestions for dealing with sexual harrassment. Learn the law, corporate and Human resource responsibility, and what to do if you think you have been a victim. For conflict related resources that are valuable but not yet classified, or do not fit in an existing conflict category. Verbal abuse at work or home is disturbing for everyone, and of course, the target. Find articles about all aspects of verbal abuse here. Conflicts at work, with customers, colleagues and other employees can sometimes boil over into workplace violence. Learn about workplace violence prevention, crisis planning, domestic violence as it affects work, and more. 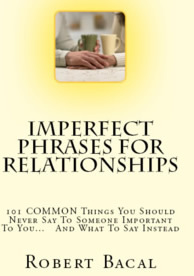 There are 566 conflict and communication resources for you to choose from!